Georgian style home designs can be described as symmetrical and orderly. TNamed for King George, their classic symmetry became the rage in New England and the Southern colonies during the 1700’s. New settlers in America drew inspiration from the elaborate style homes being built in England. Georgian floor plans have a rectangular shape and symmetrical interiors and exteriors. They often have two chimneys, a medium pitch roof, and a centered front door. 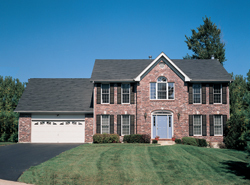 Commonly seen with wood exteriors, Georgian designs also have brick exteriors, but they are are always two-story and if one is described as a single-story, then it should be referred to as a Cape Cod style home . 2050 Sq. Ft., Width 50'-0", Depth 40'-0"
The Westbury Georgian Home has 4 bedrooms, 4 full baths and 1 half bath. 4152 Sq. Ft., Width 75'-6", Depth 91'-1"
Georgian house designs encompass the symmetrical style and historical feel that is often associated with the classic homes found all over America, but especially on the East Coast. If you love the formality of Georgian style dwellings, then look no further than House Plans and More. We are sure that you will find the perfect Georgian style plan to fit your needs and style with hundreds of Georgian House plans to choose from.